This blog was originally written by Christian Haussner for the DAI website. An estimated 75 million children cannot go to school because they have been driven from their homes by war, crisis, and natural disaster. This deprivation in turn destabilizes vulnerable regions because uneducated children grow into at-risk teenagers and young adults. To strengthen its education in emergencies (EiE) programming, the U.K. Department of International Development (DFID) drew on the DAI-led Expert Advisory Call Down service on resilience programming to research evidence on which interventions work to support high-quality schooling for displaced children—and where the evidence falls short. DAI consortium partner Cambridge Education led the research and produced six Evidence Briefs about EiE, focusing on quality and learning; protection and inclusion; cost-effective delivery; data, monitoring, and evaluation; political settlements; and accountability. From these briefs, the team compiled the Education in Emergencies Guidance Note. DFID encourages policy makers and development practitioners worldwide to consider this guidance and researchers to fill in the many knowledge gaps in this field. Here we share select observations from the briefs. The Growing Need for Emergency EducationViolent conflicts tend to last longer today than in previous decades—26 years on average versus fewer than 10 years in 1970. These conflicts often involve non-state, regional, and global actors and are increasingly linked to complex global challenges such as climate change, natural disasters, and transnational organized crime. These protracted crises mean we are seeing more migrants, both within countries and across borders. Among those migrants, children and young adults are among the most affected. Protection and Inclusion—Ensuring Schools are Safe and Inclusive. The team sought evidence on how to ensure formal and informal schools are safe spaces that protect children and welcome the vulnerable, particularly girls and the disabled. Distance to school is a major barrier for young children, girls, and children with disabilities. Strategies found to make schools safer and more accessible include chaperoned walking to school (Jordan) and recruiting village and female volunteers (Afghanistan). Tackling the effects of trauma emerged as another important theme—in Gaza, the Norwegian Refugee Council’s Better Learning Programme combined psychosocial and trauma-focused training for teachers and school counsellors. The programme significantly reduced nightmares for 70 percent of students and moderately reduced nightmares for 30 percent, with the improved wellbeing attributed to students’ improved enjoyment of school and increased level of effort. Data, Monitoring, and Evaluation—Understanding Change and Challenges. There is consensus that better data is critical to understand the challenge of intervening at scale, to inform programming, monitor responses, and assess children’s access, attainment, and education pathways as their locations or circumstances change. For example, while an estimated 60 percent of the world’s 19.5 million refugees and 80 percent of its 34 million internally displaced persons (IDPs) live in urban environments, data on them is scarce. Many are not formally registered as refugees or IDPs, which limits the effectiveness of EiE because donors and United Nations projects typically do not fund programmes to educate unregistered refugees. The authors suggest revising assessment tools to better inform urban programming. Quality and Learning—Hurdles to Effective Emergency Teaching. 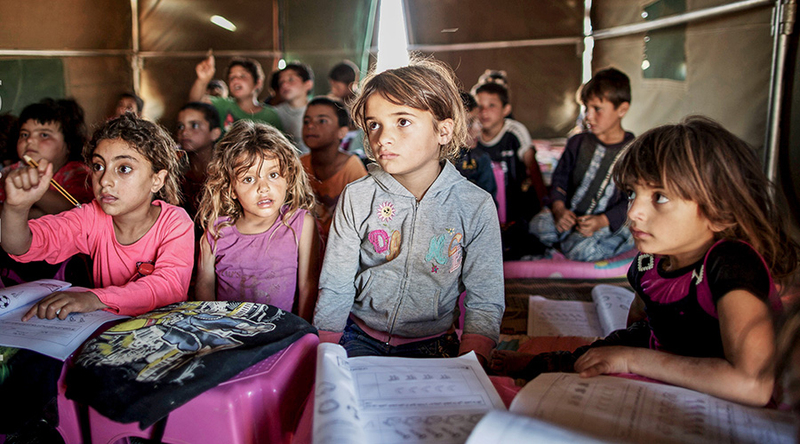 Both local and foreign teachers in emergency settings face unique challenges. While teacher quality is critical to learning quality, teachers who are refugees themselves—whether professional or recruited to fill gaps—often suffer from the same traumatic experiences, economic hardships, and unstable circumstances afflicting their students. Local-national teachers may have personal views on the conflict or crisis. On the other hand, well-meaning expatriates may have little or no experience in teaching or in crises. As a result, host-country teachers often take on increased class loads but are often not prepared to handle the psychosocial support needs of refugee students (or their expatriate colleagues). Cost-Effective Delivery—Creating Synergy of Efforts. When it comes to delivering value for money, the team found that efforts to coordinate the separate funding streams of “first response” humanitarian relief and long-term development assistance have been ineffective. While humanitarian organizations can respond to crises in weeks or even days, their program funding typically lasts six months to one year and can vary year to year depending on priorities. In contrast, development programs tend to have consistent budgets over three to five years to achieve their goals, but can take more than one year to conceive, plan, and launch. Greater attention is required to finance, plan, and implement EiE assistance throughout education crises, which typically last for years and—for the children—multiple grade and learning levels. UNICEF’s Education Cannot Wait fund, launched in 2016, was cited as a potential model for merging humanitarian and development activities. Political Settlements—Knowing What is Feasible. The research aimed to summarise what is known about establishing political consensus and coordinating government response to education emergencies (in various political contexts). There are few examples of “what works” in this area. One ongoing example comes from the Jordan Compact of 2016. Faced with an unprecedented influx of Syrian refugees, the Government of Jordan committed to schooling all Syrian refugee children in exchange for donor assistance to build more schools and address public service delivery and economic development. 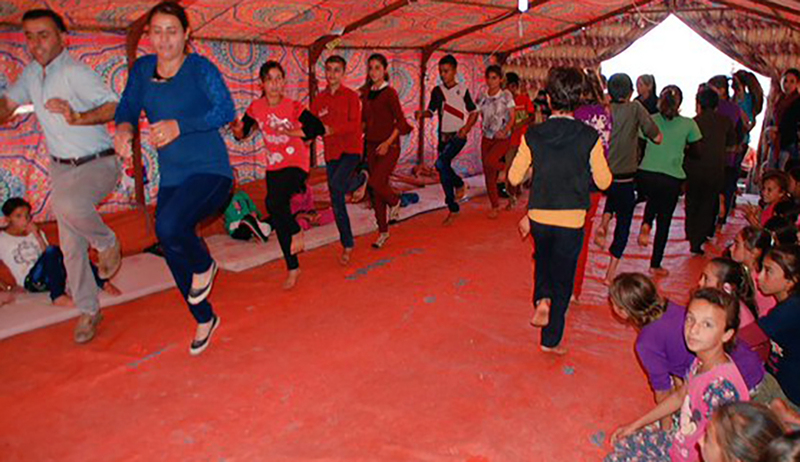 The Jordanian Ministry of Education reports that more than 126,000 Syrian refugee children had enrolled in school in host communities and camps for the 2016–2017 academic year. Accountability—Leveraging Local Commitment. Providing EiE “should ideally be led by a national government, or aligned to national government policies or systems,” the authors write, because a locally led response is more sustainable and can also contribute to peacebuilding and national unity in the longer term. For example, in response to Typhoon Haiyan in 2013, the central Philippines government co-chaired the United Nations’ Education Cluster relief effort. The government-led approach was embedded within local Philippine government systems, where local actors employed their acute understanding of local needs and ways to organise. For example, they quickly identified alternative school spaces amid the destruction and inspected them for safety and suitability. Ultimately, providing more stability for displaced children requires a long-term development approach, focused on inclusive economic growth and effective, legitimate institutions conducive to stability in fragile and conflict-affected states. This approach must include multi-year assistance in building systems for essential services such as education. 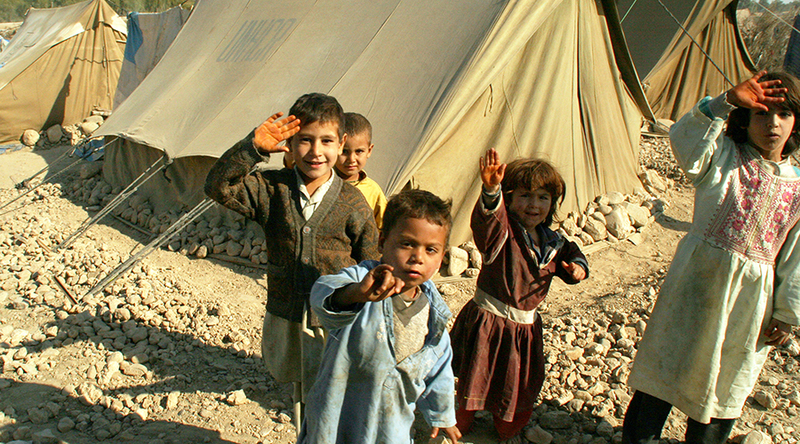 If humanitarian, development, and peacebuilding actors can work in a more joined-up way to achieve education outcomes and ensure that EiE interventions are aligned as far as possible with national systems, the Guidance Note suggests, they have a better chance of building resilient schools, supporting teachers, and providing a good education for displaced and refugee children. Christian Haussner is a DAI project manager.